At Ricky Tyler Landscapes we believe that Safety has to be our number one priority and as responsible employers, we ensure that everyone must be safe from Injury and harm and are fully committed to drive a positive safety culture at all levels within our business. If you are thinking of approaching us to undertake your gardening or landscaping services, rest assured we will assess your site and ensure that our operations are safe for our own employees and also taking into account the general public. Periodical health and safety audits are an effective way of monitoring the safety performance of the business and observing what is really happening in the workplace. A safe system of work is a formal procedure which results from systematic examination of a task in order to identify all the hazards. A COSHH assessment is a systematic examination of a task or process that involves using a potentially hazardous substance and implementing control measures to reduce the risk of exposure. 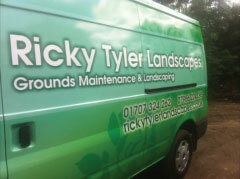 Ricky Tyler Landscapes can provide gardening and grounds maintenance services including Health and Safety Compliant Gardener's covering London, Essex, Hertfordshire, Northampton, Buckinginghamshire & Bedfordshire .